Cherdo on the Flipside: BOTB Results for "God Give Me Strength"
Whew! That puppy wasn't even close. Congrats to Bette Midler, wherever she is today. You remain the "Divine Miss M" even when you do covers of songs. A few people were confused by the video of Illeana Douglas lip syncing to the REAL voice of Kirsten Vigard. There was no video of Vigard singing live to be found. BOTB occurs on the 1st and 15th with battle results posted on the 7th and 21st of the month. A big thanks to Stephen T. McCarthy and Far Away Eyes for the genius behind the Battle of the Bands. Click on their links (and everyone else's blog link) below. Let the games continue! Of course, I alphabetized the list of our wonderful participants for your convenience. I'm nice like that (sometimes). If I missed a new participant, I'll add you as we go along. Point it out to me...I'm a geezer who needs that backup. Good (early) morning, dear Cherdo! Congratulations to Bette and everybody who voted for her. I stand by my rationale for choosing the vocal of Kirsten Vigard lip synced by Illeana Douglas. In the context of that movie about the Brill Building pop of the 60s, the song needed to be sung and arranged the way Kirsten did it. Of course, I like Sid Vicious and the Ayatollah Khomeini, so that should tell you something about my taste. Good night... uh... I mean good morning, dear friend, and enjoy your Tuesday! Amazingly enough, I haven't had to put in my tie breaker yet! In all the battles, I put songs I like up against songs I like - just different degrees of "like" sometimes. The Kirsten Vigard version was great, too. Her delivery felt authentic and that usually draws me in. But, then there's Bette - she's a wailin' icon. BTW, what are you doing up so late? Aren't you an early riser? Don't go all "party animal" on me. Enjoy your Tuesday! Hello. Congrats to everyone. Best wishes! Congrats to Bette, but I'm pretty sure I voted for Kirsten, oh well, smile. Yep, Bette was not "un-challenged" in this one. Kirsten did a fine job. Bette Midler is a cultural force. A more cheerful Streisand? Those eyes of hers are always smiling. I seem to have been picking nuttin' but winners lately. How do we go about turning BOTB into a gambling endeavor with real money 'n' stuffs? Truthfully, I'd vote Kirsten! It's a good delivery; you almost hear the painfulness of the lyrics. Bette has a great voice and she's one of a kind. I just don't hear it and believe she is asking God for strength, ya know what I mean? She is TOUGH to beat, I'll give her that. Thanks, Maurice! 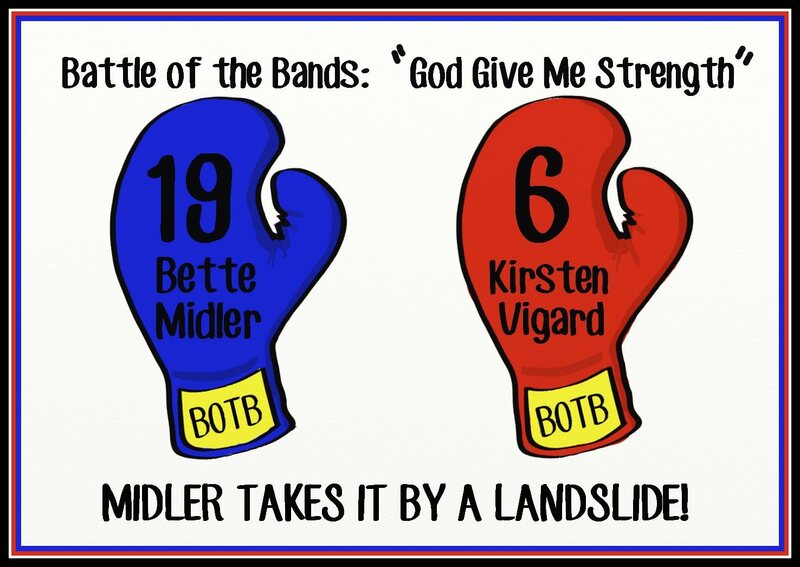 That was indeed a landslide, but I still prefer the underdog Kirsten. Good match up for a very fine song. I'm with you - Stephen pulled my vote outta me. Interesting voting results. I didn't think it would be such a landslide. Bette was my choice and I'm glad she won. Congratulations to Bette. ☺ She was my choice as well. Divine she still is! Another 'thank goodness' in my mind. I thought Kristen was kind of awful and watching that video (although I realize that it wasn't her) was just plain painful. Way to go Bette. That's the way to claim a victory.